A classic chicken recipe, inspired by James Martin's mum’s cooking in the 1970s. The vegetables are best fresh, but frozen will also do the trick. In a bowl, mix together 175g/6oz of the butter, all but one clove of garlic and half of the parsley. Season, to taste, with salt and freshly ground black pepper. Place a sheet of cling film on a clean work surface. Spoon the garlic butter onto the cling film, then pull the edge of the cling film on top of the butter and mould the butter into a log shape. Twist the ends of the cling film to seal and chill in the fridge for at least an hour, or until needed. While the oil is heating, carefully cut a deep pocket in each of the chicken breasts, inserting the knife into the bone end, just under the bone. Remove the cling film from the chilled garlic butter and slice it into 1cm/½in slices. Stuff each chicken breast with a few slices of garlic butter, pushing them into the chicken as far as possible. Sprinkle the flour onto a plate. Beat the eggs in a bowl. Scatter the breadcrumbs onto another plate. Dust each chicken breast first in the flour, then dip into the beaten egg, then roll in the breadcrumbs until completely coated. Carefully lower the chicken Kievs into the hot oil, two at a time, and fry for 8-10 minutes, or until the breadcrumbs are golden-brown and the chicken is cooked through. (To check that the chicken is cooked through, remove one breast from the oil using a slotted spoon and pierce in the thickest part with a skewer; the juices should run clear. Take care not to pierce the chicken too deeply in case the melted butter escapes!) Set the chicken Kievs aside on a plate lined with kitchen paper to drain and keep warm. Repeat the process with the remaining two chicken Kievs. Meanwhile, place the runner beans, peas, spring onions, broad beans, the remaining clove of garlic and 25g/1oz of the remaining butter in a small saucepan. Cover with 275ml/½ pint water and bring to the boil. Reduce the heat until the water is simmering, then simmer for 3-4 minutes, or until the vegetables are tender. Drain well and return the vegetables to the pan. Add the remaining 25g/1oz of butter, the remaining parsley and the garlic scapes, if using, to the pan and heat through until the butter has melted. Season, to taste, with salt and freshly ground black pepper. To serve, spoon the spring vegetables into the centre of four serving plates. 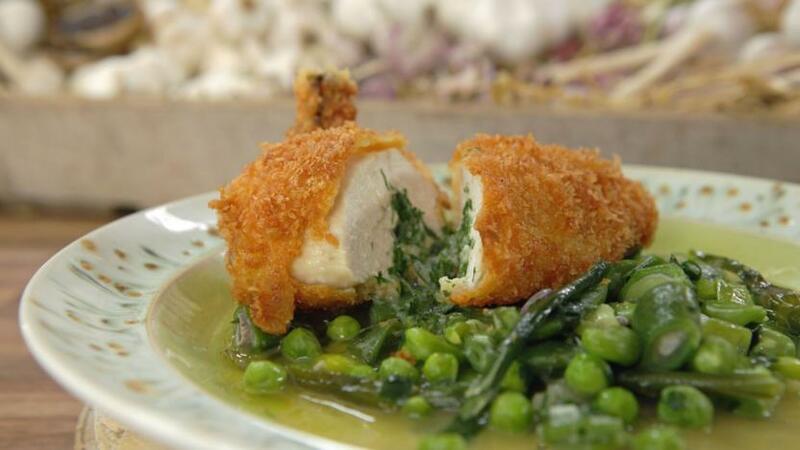 Top each portion with a chicken Kiev.